-Sift together the flour, baking powder, salt, baking soda, cloves, ginger, cinnamon and allspice. -In a different bowl, beat the eggs. Beat eggs lightly with an electric mixer (hand mixer or other), and gradually add the sugar. -Beat the oil, honey, and coffee into the eggs and sugar. Stir flour mixture into egg mixture. -Grease the pan. Pour the batter into the pan. Bake for 60 to 75 minutes in bundt or fluted pan, until cake tests done (it springs back when you lightly touch the center of it). Do not over bake. Let cool 15 minutes and remove from pan. Ovens vary, so I suggest checking it at the 50 minute time frame. You can wrap it in foil when the cake is completely cooled down, and if tightly wrapped, will last for one week at room temperature. Or, store it in an air tight container. 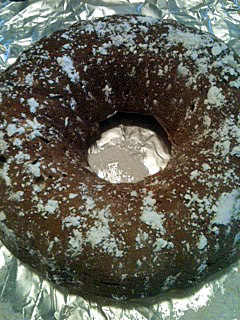 You can gently sift powdered sugar over the cake after it has cooled down, for decorative purposes. The honey gives it enough of a sweetness, so, for me, it was more for presentation. I have made it with 1/2 cup of raisins, but prefer it without them. 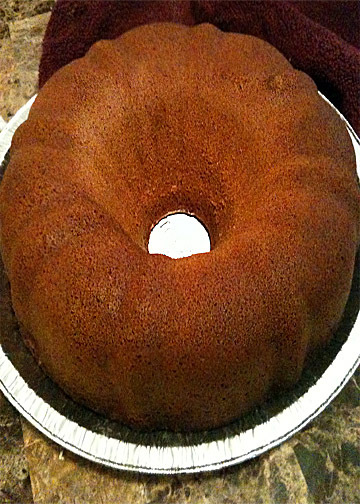 I use a bundt cake or tube/fluted pan to cook it in. It will fit into three loaf pans, also. If you use the loaf pans the baking time is approximately 40-55 minutes. Remember to sift your flour, no matter if it states it is presifted. 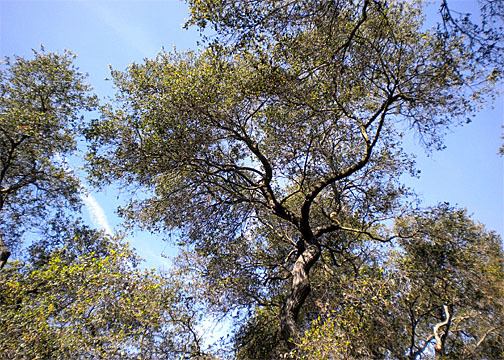 I enjoy looking up, especially through trees, when walking in a nature or natural setting. I like it when one can see jet trails within tree branches, such as in this capture. 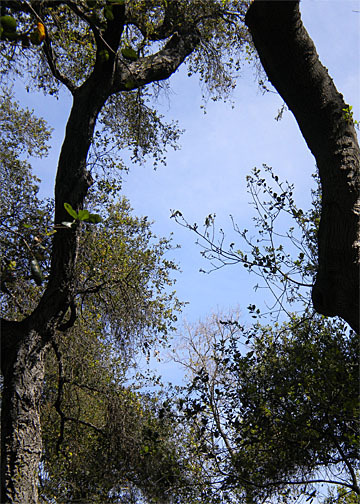 I like the view-through effect, looking between or through trees in order to see the sky. 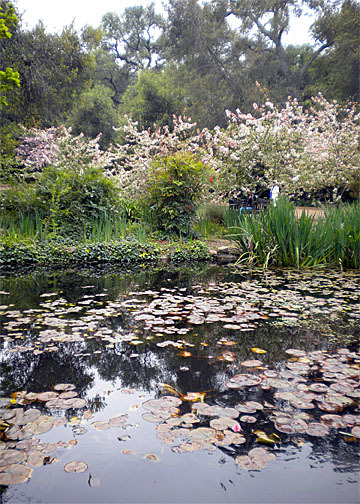 I liked the way the sky was reflected in the water. It is time for Skywatch Friday! Visit here, for more sky scenes from around the world. 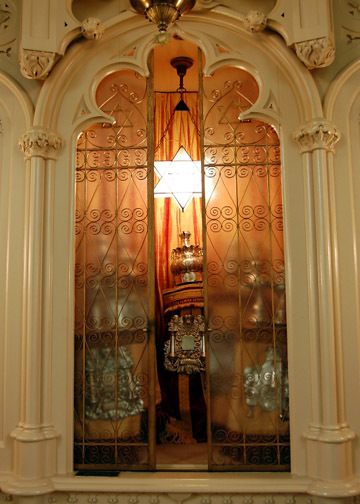 Tonight I will light my Shabbat candles, and will reflect on the Passover/Pesach, which will be upon us sooner than we might realize. Friday, April 6, 2012 is Passover eve. That is one week away, and coincidentally, it falls on Shabbat. I have begun the ritual house cleaning, the storing, moving, lending and disposing of items, both food and otherwise. I still have to bake and prepare a few things, and will get to it immediately, in order to finish cleaning house. Please take a moment to look up to the skies, and reflect on events that have transpired where you live, in your personal life, in the world, and within your family. Be well, stay safe. 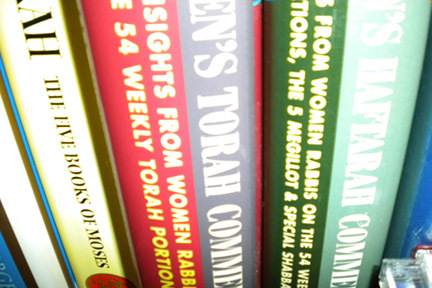 I love Jewish-related prayer books, and have a few of them in my collection, sitting on my night table. Each one affords me a different perspective on Jewish life, Jewish culture, Jewish religious issues and thoughts and Jewish family dynamics. Some hold prayers within the pages that were written by women centuries ago, offering prayers for any life event and not just for holiday celebrations. I wouldn’t be without these books close to my bedside, where I can reach out for them when I want some comfort or reassurance, or just to read before going to sleep in order to gain some insight. One book that speaks to me is entitled The Sabbath, by Abraham Joshua Heschel. You can read my review, here. I can’t say enough about Man’s Search for Meaning, by Viktor E. Frankl. I refer to it often. It helps to ground me when I need to contemplate on a serious note. You can read my review, here. The photograph above was taken a while ago, and shows some of my books relating to Jewish prayer. All photography, writing, poetry, etc. is my copyright and may not be reproduced without my express written permission. 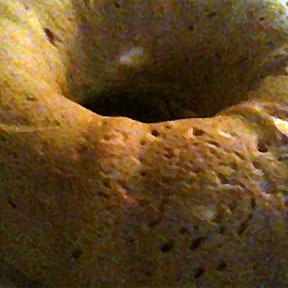 The above photograph was taken of my regular/”leavened” pound cake while it was cooling off on a rack on my counter top. Unfortunately I didn’t capture it when it had powdered sugar sprinkled on it. But, nonetheless, my family and friends gobbled it up last year during our Rosh Hashanah dinner. I put the pound cake on a large circular tray, positioned apples around the pound cake, along with some honey in slender bowls for dipping. I also alternated bowls of orange marmalade for the pound cake. I think it made a nice presentation. Mix all ingredients (adding the flour a little at a time) and spoon into greased and floured bundt pan. Bake at 350 degrees for about 1 hour, depending on ovens. Mine took 50 minutes. For the unleavened pound cake, one must remember that it will not rise considerably like the regular or “leavened” pound cake will. It will be a heavier consistency. -Turn batter into greased bundt pan. Bake at 325° for 1 hour (or until a toothpick comes out clean. Some ovens need a bit more or a bit less time. Mine baked in 55 minutes. -Sprinkle with powdered sugar, or serve with your favorite topping, such as orange marmalade. I love honey cake, and so does my family. My friends also tell me that they like my honey cake, and when someone tries it for the first time, the person usually asks for my recipe. 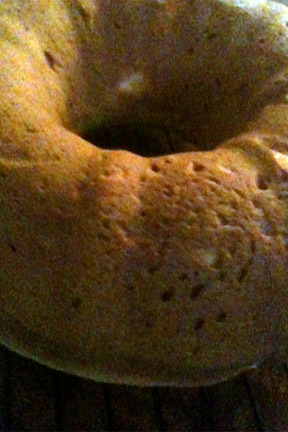 The photograph above, is of one of my finished honey cakes. 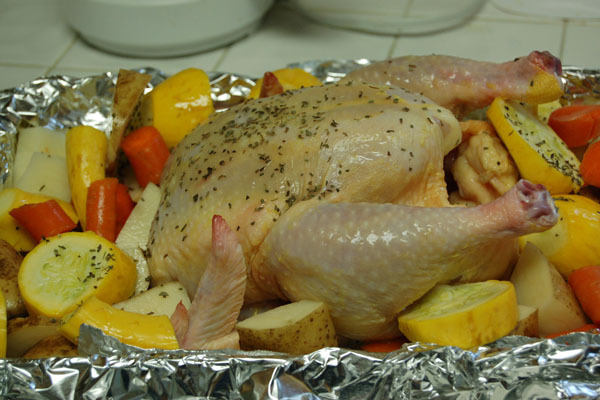 -Preheat oven to 325 degrees F (165 degrees C). I use a bundt cake or tube/fluted pan to cook it in. It will fit into three loaf pans, also. -Beat the oil, honey, and coffee into the eggs and sugar. Stir flour mixture into egg mixture. Chop the almonds. Stir into batter. -Grease the pan. Pour the batter into the pan. Bake for 60 to 75 minutes in bundt or fluted pan, until cake tests done (it springs back when you lightly touch the center of it). Do not over bake. Let cool 15 minutes and remove from pan. I baked it for 55 minutes and it came out perfect. Ovens vary, so keep an eye on the cake. If you use the loaf pans the baking time is approximately 45-55 minutes. 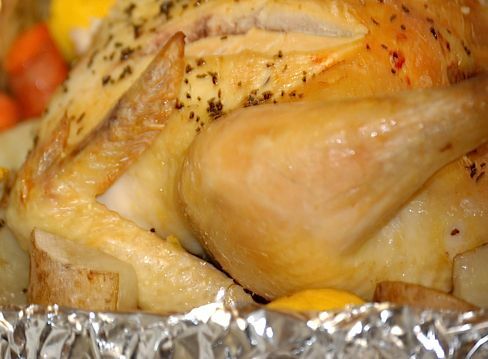 You can wrap it in foil when the cake is completely cooled down, and if tightly wrapped, will last for one week at room temperature. With the High Holy Days about to begin, I thought this would be a nice addition for your Break-the-Fast table. cook for 15 more minutes or until thermometer reaches 180 degrees.